Monsieur le Rosbif & Johnny Frog: Let the sledging begin! The sledging, or trash talk, begins now! Again, I am playing the non-French in my second January Napoleonic big-bash at Tim's. Last year I played the Prince of Orange in the Quatre Bras sector of the Battle of Ligny / Quatre Bras. While our sector couldn't hold the crossroad, we managed to pull out after giving the French a bloody nose, while on the Ligny side, the Prussians gave the Emperor curry and kept the field after seeing him off for an overall Allied victory. I attribute this allied victory not to my contribution on the field, which didn't amount to much, but to my bringing a bottle of very special wine designed to bolster the morale of the non-French types. I am planning to bring another couple bottles to the great 2011 Aspern-Essling weekend. 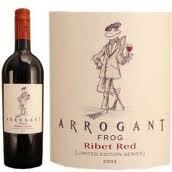 I am speaking, of course, of (ironically) a French wine by the name of Arrogant Frog! Thanks to Alanus, Dux Homunculorm for his beer 'n' wargames posting. Maybe we could come up with a broader food 'n' booze idea after the Aspern weekend? I'll have to try and find some Austrian gewurtztramminer, as well, in anticipation of an Austrian victory! Now to put the finishing touches on the dyke so that it's ready for the weekend. Alanus, we use a club house ruleset based on Empire 6 (boo, hiss! I can hear the TMPers gnashing teeth). I'd love to see your Napoleonic figures. I'm the only 1/72nder at the club. They fit with 25mm more or less, but 28mm seems to be the go these days, and my chaps look a little underfed next to them! I found several bottles for sale at Safeway, in Melbourne, the other day.